No one is above the law, it's said. And you can trust Mumbai Police to reinstate that statement. 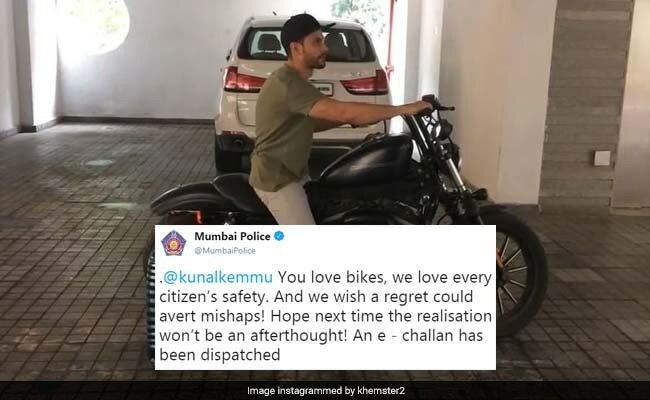 In a Twitter exchange gaining traction, Mumbai Police has called out actor Kunal Kemmu for riding his bike without a helmet. Interestingly enough, the incriminating pictures were first posted by the Go Goa Gone actor himself. It all started when, earlier today, the actor tweeted an apology for riding his bike without a helmet. Calling the incident 'embarrassing' the Golmaal Again actor tweeted, "I don't want to set the wrong example!" Almost within an hour of his tweet, Mumbai Police tweeted him back with a stern warning and a punishment. "You love bikes, we love every citizen's safety. And we wish a regret could avert mishaps!" says the tweet. They added that an e-challan was on its way for the actor. The fine amounts to Rs 500 and has been dated for March 21. Graciously enough, Kunal Kemmu accepted the punishment. The Twitter exchange has gained quite a bit of attention. "When you apologize in a picture and the Mumbai police sees it," says one Twitter user. "It's very good to see you accepting your mistake," says another. Meanwhile some had questions for Mumbai Police. "How do you verify the date @MumbaiPolice It can be 5 year old pic?" asks a Twitter user. "How come you did not require location or number plate to issue eChallan. For others you always require location and number," wonders another. This isn't the first time something like this has happened. In November last year, actor Varun Dhawan found himself in a sticky situation when Mumbai Police called him out for flouting traffic rules. "We expected better from a responsible Mumbaikar and youth icon like you," tweeted Mumbai Police, who also sent the October actor an e-challan.